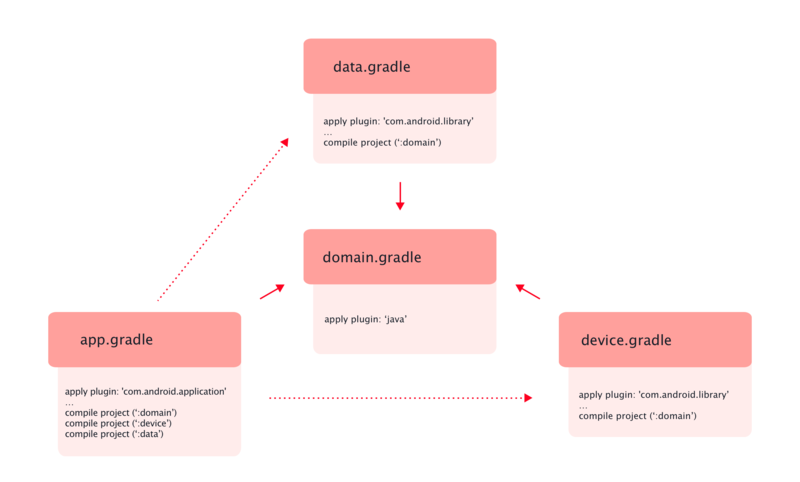 In the last part of our Android Architecture series, we adjusted Clean Architecture a bit to the Android platform. We separated Android and the real world from our business logic, satisfied stakeholders and made everything easily testable. 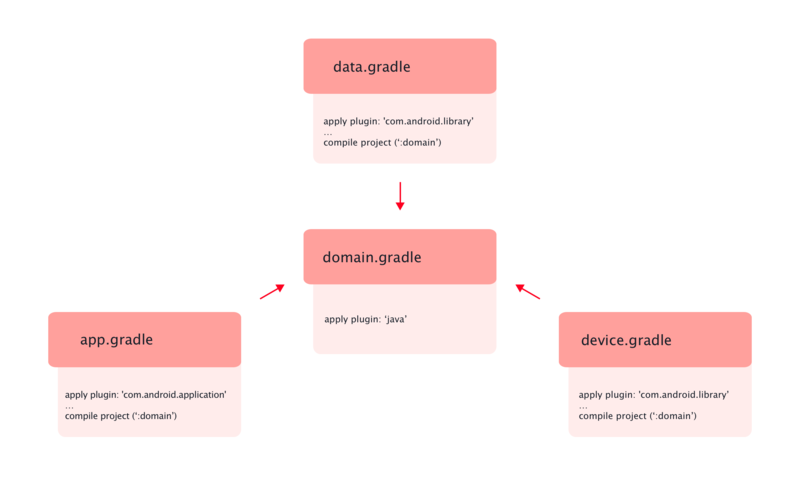 The theory is great, but where do we start when we create a new Android project? Let’s get our hands dirty with clean code and turn that blank canvas into an architecture. We will lay down the foundations first – create modules and establish dependencies among them to be on par with the dependency rule. Entities, use cases, repositories interfaces, and device interfaces go into the domain module. The data module should hold everything related to data persistence and manipulation. Here we will find DAOs, ORMs, SharedPreferences, network related stuff like Retrofit services and similar. The device module should have everything related to Android that’s not data persistence and UI. In example, wrapper classes for ConnectivityManager, NotificationManager and misc sensors. We will make both Data and Device modules android modules, as they must know about Android and cannot be pure java. 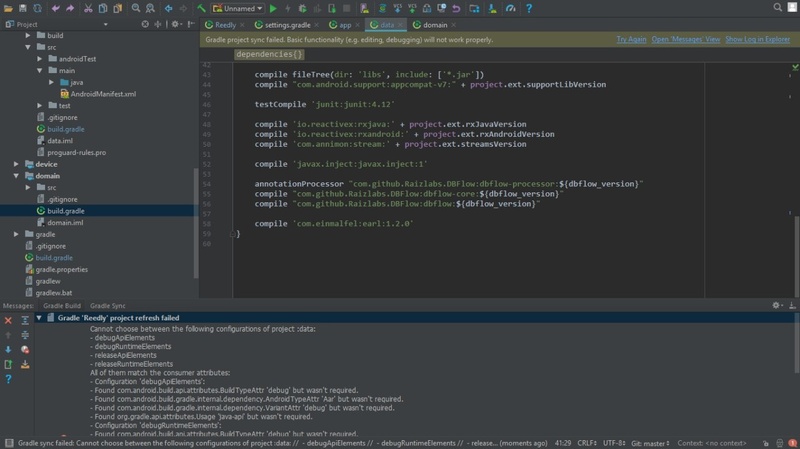 This module is already created for you by the Android studio when you create a project. Here you can place all the classes related to the Android UI such as presenters, controllers, view models, adapters and views. Dependency rule defines that concrete modules depend on the more abstract ones. You might remember from the third part of this series that UI (app), DB – API (data) and Device (device) stuff is together in the outer ring. Meaning that they are on the same abstraction level. How do we connect them together then? But, we are dealing with Android here and things just cannot be perfect. Because we need to create our object graph and initialize things, modules sometimes depend on an another module other than the domain. For example, we are creating object graph for dependency injection in the app module. That forces app module to know about all of the other modules. Finally, it’s time to write some code. To make things easier, we will take an RSS Reader app as an example. Our users should be able to manage their RSS feed subscriptions, fetch articles from a feed and read them. let’s start with the domain layer and create our core business models and logic. The very first thing our users will do when they open our app is add a new RSS feed subscription. So to start with our interactors, we will create AddNewFeedUseCase and its helpers to handle feed addition and validation logic. Note how our naming in the domain layer clearly propagates the idea of what our app is doing. *Constructors are omitted for the sake of brevity. Now, you might be wondering, why is our use case, as well as our callback, an interface? To demonstrate our next problem better, let’s investigate GetFeedArticlesUseCase. 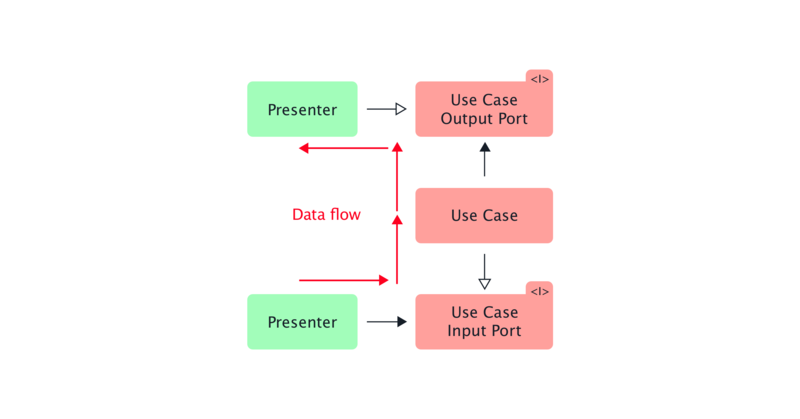 Here comes the data flow problem, the use case is in between presentation and data layer. How do we establish communication between layers? Remember those input and output ports? Our use case must implement the input port (interface). Presenter calls the method on the use case, and the data flows to the use case (feedId). Use case maps feedId to feed articles and wants to send them back to the presentation layer. It has a reference to the output port (Callback), as the output port is defined in the same layer, so it calls a method on it. 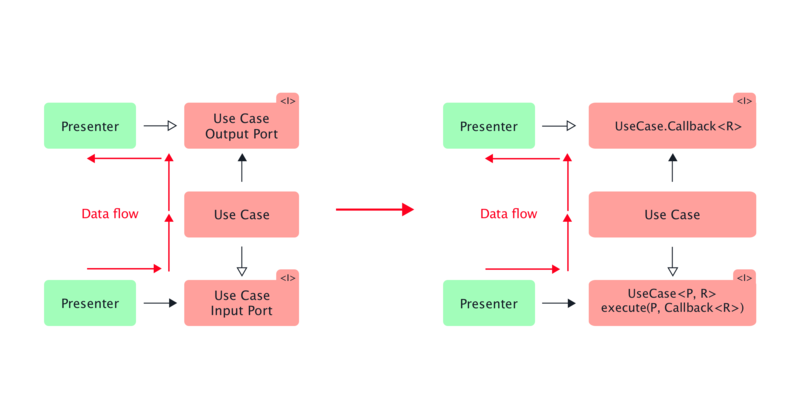 Hence, data goes to the output port – presenter. UseCase interfaces are Input ports, and Callback interfaces are output ports. One last thing to note in the domain layer is that Interactors should only contain business logic. And in doing so, they can use repositories, combine other interactors and use some utility objects like FeedValidator in our example. Awesome, we can fetch articles, let’s show them to the user now. Presenter for that view has a very simple presentation logic. It fetches articles, maps them to the view models and passes on to the view, simple, right? Simple presenters are yet another feat of the clean architecture and presentation-business logic separation. Where our parameter P is integer feedId, and return type R is a list of the Articles. You do not have to use presenters to handle presentation logic, we could say that Clean architecture is “frontend” agnostic – meaning you can use MVP, MVC, MVVM or anything else on top of it. Callback interfaces are now gone and we use rxJava Single/Completable interface as our output port. Although it’s a bit hidden, the same data flow inversion principle still holds, because without RxJava presenters were implementing the callback, and with RxJava subscribers are also contained in the outer layer – somewhere in the presenter. Data and Device modules contain all of the implementation details that business logic does not care about. It only cares about the contracts, allowing you to easily test it and swap out implementations without touching the business logic. Here you can use your favorite ORMs or DAOs to store data locally and network services to fetch data from the network. We will implement FeedService to fetch articles, and use FeedDao to store articles data on the device. Each data source, both network, and local storage, will have its own models to work with. In our example, they are ApiFeed – ApiArticle and DbFeed – DbArticle. Concrete implementation of the FeedRepository is found in the Data module as well. Device module will hold implementation of the Notifications contract that is a wrapper around the NotificationManager class. We could perhaps use Notifications from our business logic to show the user a notification when there are new articles published in which the user might be interested in and drive engagement. You might have noticed that we mentioned more models than just entities or business models. In reality, we also have db models, API models, view models and of course, business models. It is a good practice for every layer to have its own model that it works with, so your concrete details, such as views, do not depend on the specific details of your lower layer implementations. This way, you won’t have to break unrelated code if you, for example, decide to change from one ORM to another. To make that possible, it is necessary to use object mappers in each layer. In the example, we used ViewModelMapper to map domain Article model to the ArticleViewModel. Following these guidelines, we created a robust and versatile architecture. At first, it may seem like a lot of code, and it kind of is, but remember that we are building our architecture for the future changes and features. And if you do it correctly, future you will be thankful. In the next part, we will cover maybe the most important part of this architecture, its testability and how to test it out. So, in the meantime, what part of the architecture implementation did you find interesting the most? P.S. Since we already know you’ll ask, you can download the source here. Five is a mobile design and development agency founded in Croatia with a strong presence in New York. We help brands like Rosetta Stone, Rhapsody, Squarespace, and many others, to build and execute their mobile strategy and products. Five and our product company, Shoutem (a platform for mobile apps) together employ over 140 people in Croatia and the US. You are welcome Dmitriy! We will share source code in a week. Source code is finally here! You can find it on the bottom of the article. I am not sure how to fix it , cause I tried Googles recommendations – it didn’t work. Hey @dmitriykhaver:disqus , can you verify you have Java 8 installed on your machine? The screenshot you provided is just a warning, it should be breaking the app configuration. Is it a bug in gradle ? Why are you using Retrolambda instead of Java8? Stable version of Android Studio doesn’t configure either. Thank you. It’s a really helpful article. BTW…Is the source code available yet? Thank you very much for the source code. BAM now with sourcecode. Thanks guys for the amazing articles and your work here for the community!! This is by far the best blog on clean architecture I have encountered on the web. This made my day, thank you :). Also can you tell us when the article on testing is going to be out? We are working on an article about testing and it should come soon! Nice job. Where should we put the app state, and how to subscribe the state stream if we uses RxJava? I just wonder how you model DB transactions in clean architecture. Do you specify methods like beginTransaction(), setSuccessfull() .. in Repository interface and then use them in Interactors? DB transcations are implementation detail tied to the database and data layer. In cases when you can, i.e. : you have all the required data that you want to store in the DB, transaction logic should be hidden in a repository. On the other hand, if you are fetching chunks of data from different sources and you want to store data trough a transaction chunk by chunk, and you really can’t hide transactions, model your repository to accept Observable object. That stream will abstract transaction in a way that data layer can open transaction when it subscribed to a stream. And close transaction when stream either completes or an error happens. Hello Mihael. Nice article. Thank you so much by code. I am not understanding the function of the ViewActionQueue which is injected into BasePresenter. Can anyone help me with this doubt? ViewActionQueue is “frontend” implementation detail and it is not really important for the Clean architecture. ViewActionQueue is a middle man in between a Presenter and a UseCase. It subscribes to a given chain that results in a ViewAction, awaits for completion of that chain and passes result ViewAction to the Presenter. We are not retaining our Presenters when configuration change occurs. ViewActionQueue will ensure that if one Presenter invokes a UseCase, the second Presenter that we use after the Configuration change will get the result ViewAction of a UseCase that the first Presenter invoked. Nice article series. Still, I have one problem and I didn’t find an answer here. So, I assume that you are using constructor injection (manual, or using Dagger, doesn’t matter) to pass an use case instance to a presenter, right? How do you handle situation where one use case should be called multiple times from one presenter? For example, you have a list of items, where each item has delete button. Each click on that button should execute DeleteItemUseCase. How do you solve that? I have few ideas on my mind, but none of them seems very clean to me. 3. Do you have any third way of handling such situations, by any chance? You are right, use case factory smells bad. Not only that it introduces additional boilerplate, but it also comes with an additional cost of use case allocation for every required use case. UseCases should be stateless and reusable, meaning that we must be able to call an instance of a use case multiple times and that it will work as expected. Let’s take FavouriteArticleUseCase as an example. We call it repeatedly in the ArticlesPresenter. Thanks for the answer. Nice trick, looks like it should work. I’m afraid, though, that using one use case instance would cause some bugs if the use case object had some internal state. I don’t see that happening often, but it could, couldn’t it? 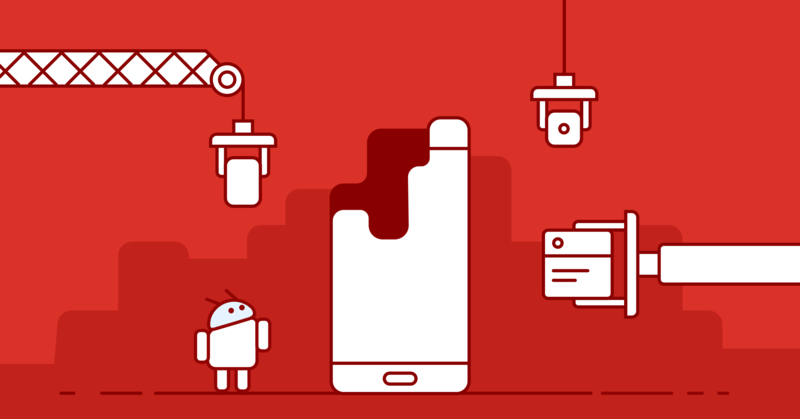 Hello Five Agency, awesome articles on Android Clean Architecture! Cannot understand one thing though, shouldn’t we aim to reuse domain models, maybe declare them as interfaces and use concrete models (present in data module) to return them from repository? Hi Tomo, thanks for this nice article! One question: what if a presenter uses multiple use cases (interactors), and thus implements multiple Interactor.Callback interfaces? They all have the same method signature, so how can you handle them separately? Only by implementing them as anonymous classes? Oh, 1 more question (sorry for the many questions, but I think it’s clearer to answer them separately): Is it possible to use a DI module? Then that module will know all other modules, instead of the App module. Thanks for this great article about Clean Architecture, hope I found it earlier. ow in such architecture places a external triggers like FCM notifications or LocationFence. In my app I need to show screen (start activity) when I get notification from FCM and when user enter to zone (base on location fences)? I just saw your source code. What’s the point of using Use Cases with generics? Why not just “excute(String name, int id, ….so on)? Do you use Robot pattern to test your UI with Espresso?